Create an Easter scene with candy in our resurrection craft project for kids. Bonus: The PDF Version is great to easily print multiple copies to use with your Sunday School, Troop or other group. Includes all instructions for this entire project without margins, ads or logos. Bonus: The PDF Version is great to easily print multiple copies to use with your Sunday School, Troop members or other group. Mix the first 2 ingredients and 1 cup of powdered sugar together. Add more powdered sugar until the frosting is stiff enough to maintain peaks. Add green liquid food coloring and mix well. (Add additional powdered sugar until the frosting holds peaks again.) Recipe makes approx. ½ cup of frosting. Cut the crispy treats for your scene: For the regular treat base, divide the 13 x 9 pan into three equal segments along the length of the pan. Remove and trim edges if desired. Each segment will measure approx. 4 x 8 inches after it has been cut. For the chocolate treat pieces, first, cut the treats into 1 inch strips. Resurrection Scene Tips: Lay wax paper on a cookie sheet or platter and then put down your 4” x 8” rice crispy treat base. To create the tomb, start with the 3 ½ “piece and the two, 1” pieces and place them as shown in the photo. Next, add the two, 2 ½ “pieces. Last, add the 2” piece. 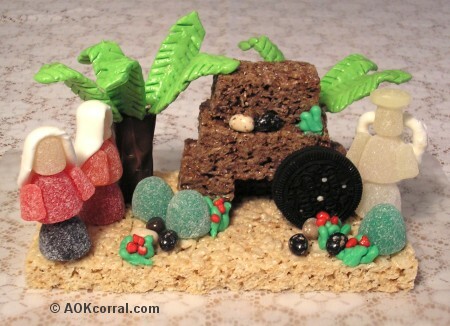 Last photo shows placement position of cookie stone and tree trunk. See photo at top for final placement of characters and ideas for scene; bushes (gumdrops), grass (frosting), flowers (nerds), and rocks (raisinets/jellybeans). Tomb Visitor Tips: When you cut a small gumdrop in half for the arms, the inside will be sticky enough for them to stick to the body. After you finish assembling the person, make a head scarf by rolling out a piece of white taffy. Angel Tips: Make the angel the same way that you made the other figures but no scarf. Add some frosting to the back of the angel body and top of the head. Paste the yogurt covered pretzel to the angel back as shown and a lifesaver onto the angel head. Palm Tree Tips: Use a rolling pin or large dowel to smooth out the pieces of taffy. Do NOT roll out very much. It must be thick enough to insert a toothpick into the taffy. Insert the toothpick into about 2/3 of the length of the branch. This will help support the weight of the candy. You can use scissors to make small cuts on either side of the branches to create the look of palm leaves. When you insert the palm branches into the candy bar base, be sure to stick them in, pointing up. The branches can be heavy and will sag down if they are hanging out to the sides too much.